I remember as a young teenager going by myself to see "On the Waterfront" at the Whalley Theater in New Haven. I was so mesmerized by the performance of Marlon Brando (30 years old at the time) that it took a dozen more viewings – really, that's how many times I saw the film, maybe more – before I realized that the greatest actors of the day – Eva Marie Saint, Karl Malden, Lee J. Cobb, Rod Steiger – were also featured in the movie. In the years following that spellbinding experience, I saw dozens more movies, many with tremendously talented stars and amazing performances. But Brando remained a towering icon to me, unchallenged by any of his many idolaters and competitors. But 20 years later, in 1974, "Godfather: Part II" debuted, and 31-year-old Robert De Niro, playing the young godfather-to-be, Vito Corleone, hypnotized me as Brando had decades before. In fact, I remember walking out of the theater and, like a crazy person talking out loud to myself, I said, "I'm sorry, Marlon." In fact, at that moment, I left Marlon for Robert. Not that I still didn't love Brando for the artistry he has given to the world. But for me, it was De Niro all the way, in spite of the silly films he has made in recent years to keep his decadently lavish lifestyle afloat. Again, I saw Godfather II at least a dozen times, even quite recently on TV, and always marvel at De Niro's staggeringly powerful and affecting performance. The performance, I remind myself, of an actor, a person who pretends professionally to be someone else. But when the pretending is done, and the actor returns to his or her actual persona, that is when the public gets an inside view of "the real thing." No matter how people describe themselves, which is usually in positive, even self-aggrandizing terms, the arch determinant of who they really are – their characters, decency, maturity – comes down to their behavior. Show me a man or woman of great accomplishment who in public has what amounts to an obscenity-spewing temper tantrum and I'll show you an adult fixated on childhood, in essence a child who has no self-control, no concern about the effect vile language has on young viewers, no respect for community norms, no awareness of his or her infantilism. 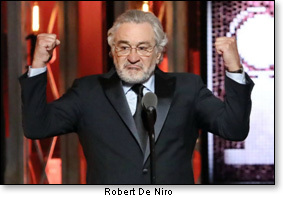 And the support that such a person receives – as Robert De Niro's standing ovation at the recent 2018 Tony Awards attests – is a testimony to the uniform immaturity of his show business colleagues. That's right, when De Niro stood up and practically spat into the microphone, "I'm just going to say one thing – F...Trump! It's no longer 'down with Trump.' It's 'f... Trump! '," the crowd of like-minded children jumped to their feet to applaud the vulgarity. Think of all those Madonna fans who bought what she pretended to be – a peace-preaching, red-bracelet-wearing, love-and-understanding adherent of Kabballah – only to realize that she was just another leftist hypocrite when she suggested that the only way to cope with a Trump presidency was to blow up the White House....this before she segued into obscene language for the entire world to hear, including her children. Think of Kathy Griffin, the consistently unfunny comedienne, who thought the only way to cope with a Trump presidency was to hold up a grotesquely gory, blood-soaked head of the president, detached from his body. Think of Bill Maher, another remarkably unfunny comedian, who thought that the only way to cope with a Trump presidency was to wish dire economic hardship on his fellow citizens in the form of a crashing economy and recession. 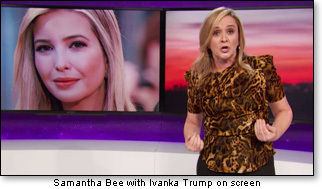 That is not to omit classless media people like Samantha Bee, who could not control inflicting her poisonous venom on Ivanka Trump, or the scandal-plagued Joy Reid, whose Twitter tantrum objected to the president's use of the words church, family, police, military, and national anthem in his State of the Union address. What does this remind you of? Hint, hint....visit any daycare or preschool or elementary school playground in America where children ages three to six are playing. What do they do when they get into a conflict? Why, they have tantrums, they throw things, they call names, and they cry. Speaking of calling names, blogger Jeff Dunetz reminds us that, "Just a few weeks before Trump was elected president, De Niro confessed: "I'd like to punch him in the face....he's a punk, he's a dog, he's a pig, he's a con, a bullsh– artist, a mutt who doesn't know what he's talking about, doesn't do his homework, doesn't care...."
Aside from Brando and De Niro, one of the actors I also admired for his blazing talent on screen was Rod Steiger, not only pitch perfect as Marlon Brando's older brother Charley as the right-hand man of mob boss Johnny Friendly in "On the Waterfront," but for his searing performances in "The Pawnbroker, "In the Heat of the Night," and "Dr. Zhivago," among many other unforgettable movies. And then it happened. While my husband Steve and I were watching late-night TV, we saw Johnny Carson interview Rod Steiger. I don't remember the exact words the famed actor said, but it was crystal clear from the beginning of the interview to the end that we were witnessing a person of bloviating self-importance and genuine stupidity! Actually, it's not such a mystery. As we saw with De Niro's unhinged, Travis Bickle performance at the Tony Awards, it's pretty easy to pretend, but impossible to fake who you really are. 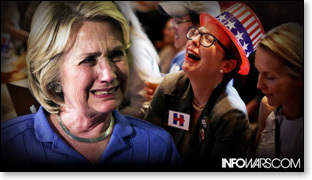 At this point, as President Trump approaches 18 months of non-stop dazzling accomplishments – from an upwardly-zooming GDP, to record employment, to the end of strangulating regulations, to strengthening our military, to unprecedented leaps forward in foreign affairs, to the complete dismantling of every destructive program and policy of the Obama regime – the Democrat children among us are still drooling, spitting, kicking, throwing mud pies, hurling dirty words, crying, lying, and generally devolving at a record pace. Frankly, I'm quite pleased. For all the contempt the left has for We the People, they proved in the last election that they are not only infantile, but clueless. While they – and their corrupt enablers in the media and Hollywood and Obama's FBI, CIA and DOJ, et al. – were clucking about President Hillary, every poll they cited, every spin of every expert was wrong, wrong, wrong. What they failed to appreciate was that America was watching...and listening...and absorbing the sheer power and promise of Donald Trump and the utter fecklessness and, well, crookedness of Crooked Hillary. President Trump, in response to De Niro's deranged rant at the Tony Awards, speculated that the actor had "received too many shots to the head by real boxers in movies" and that "he may be 'punch-drunk.'" "Wake up Punchy!" the president tweeted. Personally, I can't wait to see the ads of "Punchy's" tantrum in the upcoming midterm races! They ought to be worth millions of votes.